The past few years have not been particularly kind to late 80’s and early 90’s nostalgia. 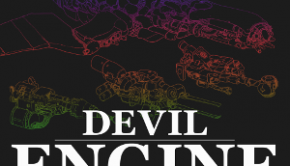 Megan Fox’s acting and Michael Bay’s directing saw Transformers: Revenge of the Fallen all but murder whatever happy memories fans retained from the original cartoon series. An exception to this trend — and one that I’m quite thankful for — is the music produced by fans of 8- and 16-bit videogames who seem hellbent on preserving the good memories and iconic music from the formative years of the videogame industry. 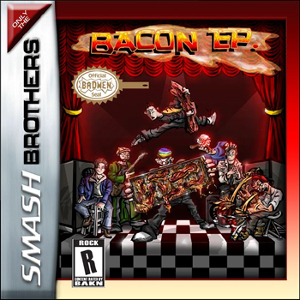 The Smash Brothers’ Bacon EP serves as a shining example of this reactionary movement which, unlike Hollywood blockbusters built on the bones of ravaged franchises, actually preserves the feel of the source material. This is probably because The Smash Brothers do it out of love, and not for a sense of profit. After a physical release at MAGFest, Bacon EP is available as a completely free download on The Smash Brothers’s website which makes it all the better. With industry veteran Jake Kaufman and six other musicians at the helm of The Smash Brothers, it should come as no surprise that Bacon is as good as it is. By Bacon I am, of course, referring to the album and not the breakfast meat, the goodness of which is well known by all and lies, unfortunately, outside of the scope of this review. The Smash Brothers have long been a feature of the annual MAGFest and, with this EP, their sound is finally available to fans of videogame music who haven’t had the opportunity to attend the convention. The album opens impressively with “Makes you Starowngahhhh”, an electric guitar-driven virtuoso performance of Life Force‘s chiptune track that conjures Eric Johnson’s technical guitar prowess throughout. This song makes a reappearance in the unapologetically and awesomely cheesy 29-second-long “Bonus Track” whose “vocals” are next to impossible to excise from your mind when you give “Makes you Starowngahhhh” a subsequent listen. “Actraiservania” is unique among the other tracks offered on Bacon as it is the only mash-up track, combining elements of Actraiser and Castlevania. Jason Zaffary’s expert keyboard work shines on this track serving as a bridge between the two disparate themes and lend the requisite pipe-organ feel to the Castlevania portion (although the soaring guitar work doesn’t hurt any, even with the key change at the 2:30 mark). “Onett” and “FF1town.wav” make up the mellow offerings of the album, but manage to stay crisp and energetic throughout. “Onett” clips along nicely, built on a relentless walking bass line and loose guitar work which tranforms the chiptune chirps of Earthbound in upbeat, sun-drenched California surfer rock. “FF1town.wav” is given a more soporific treatment (I, as always, blame the glockenspiel) with a capriccio variations of the theme drifting in and out perfectly as each of The Smash Brothers plies their hand at covering one of Nobuo Uematsu’s most famous early compositions. On the topic of Uematsu, “Missile Ride” from Kaufman’s own Contra 4 is an extremely up-tempo rock piece that features enough keyboards to make The Black Mages proud. Again, the Eric Johnson guitar work takes center stage in all of the right ways and proves that The Smash Brothers are more than just a bunch of fanboys with guitars — they’re each capable musicians who happen to love videogames. In terms of sheer standalone rock value, it’s second only to “Makes you Starowngahhhh” …although “Shaking Hands with the Devil” from U.N. Squadron isn’t too far behind. With Bacon, The Smash Brothers make the strongest argument for the validity of the “Chiptune Rock” musical genre since The Minibosses’ self-titled debut album was released almost a decade ago. The only real complaint that can be levied against Bacon is its disappointing length: the seven tracks (one the bonus track exclusive to the digital release) come in at just over 22 minutes, which is far too short for such an excellent and loyal fan album such as this. Posted on August 1, 2012 by Matt Diener. Last modified on January 22, 2016.